Good Morning all. I have a four zone system with all Irritrol 1" zone valves. They are only a couple of years old. Just the other day I replaced all 4 solenoids because a few of them were not opening/closing correctly. Now all four zones are opening and closing correctly, but when the system turns off I am getting a loud "thumping" noise, a pulsation, like a recurrent water hammer in at least three of the zone valves. The whole area shakes and water dribbles/spurts out of the backflow portion of the valves. This goes on for quite awhile. A bit of water also spurts out of some of the sprinkler heads. If I turn the system back on the thumping stops and the system works properly. I do not know how long this "thumping" occurs although it seems to stop after awhile. I should time it. Without muddying the waters here, I have another issue. I redid all this piping 2 years ago during a major remodel, and I know I had no leaks and everything was working well. I own a hunter MP rotator gauge and I am getting the following readings. Zone #1- only 20 psi Zone#2- 38psi Zone#3- 44 psi Zone#4- 32 psi. Of course, zone #1 is what I care the most about. I have only 8 heads on this zone. The stream is weak and I need more water on the grass in this zone. I would actually like to add a couple of more heads, but need to find out the reason for the low pressure here first. I'm guessing that you will advise me to cap the 8 heads on zone #1 to find a leak. I am no expert here by any means. I designed and built my own house, delivered my own kids and am proficient in most all aspects of the normal electrical, plumbing, framing, etc. I thought I had a pretty good handle on my sprinkler system, but it is obvious I have more to learn. This is vexing me. Thank you in advance for any help you can give. Sorry...I should add that I did check other threads on this issue, but it appears that others have stated that they have this "thumping" happen when the zone valves are ON....mine occurs only when the system turns off. So far it has been thumping at least 30 minutes after the system turns off with no stopping. I do have the water volume, (the large stem valve on top of the valves) turned on all the way, as I think I want the most volume/pressure I can have, especially on zone #1). Perhaps I need to turn down Zone #2....? Ok....sorry for the repeated posts. I did go back to my zone valves and adjusted all of them, but the thumping still occurred. When I turned off zone #4 all the way, the thumping stopped. I was then able to open it back up and the thumping did not return, no leaking from the valves remained, and all seems well. I'm guessing that when my system turns on again and runs through the cycles, the thumping will return until I go out there and turn zone 4 all the way off and then turn it back on. I'm guessing I have an internal problem with a component of zone #4 valve...like replacing some zone valve guts? Thank you in advance for your good and kind help. Thank you Wet Boots.....I know you are very helpful to many here and it is appreciated. I did a search on the sprinklerwarehouse website for these heads and At the risk of looking like an idiot, I did not find a head that is closed. So....I am assuming that you are telling me to just buy an adjustable head that screws on and adjust it to zero.....a small amount of water may still come out but it would stop enough of the flow to force any leak to hopefully show. Along that line of thinking, perhaps just turning the MP rotator all the way to almost closed might do the same thing. Yes, spray nozzles with screens combine to make a full shutoff. Thumping noises when a valve opens is generally too much flow demand in a zone, assuming everything else is perfect. Simplest possible remedy is a new valve diaphragm. If your system has a RPZ backflow preventer, and it spits water repetitively when a zone shuts off, try to vent air from it. Thank you Wet Boots.....your time and knowledge is appreciated. This is an older picture of my zone valves....I have since moved the shut off to an underground one and cleaned up the wiring, etc....but basically these are the type/brand of valves.It is interesting that you mention backflow preventers....our city recently came out with everyone needing one and having it inspected yearly. Especially if you have a water softener, Furnagator, etc. 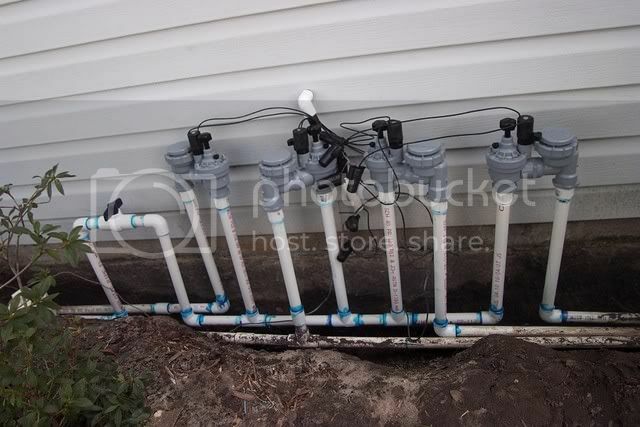 They checked my neighbor who has the same type of sprinkler valves that I have and they told him that he did not need one because his zone valves were already compliant.....so I am thinking mine are all right also. Thanks again! Thank you Wet Boots...will do!